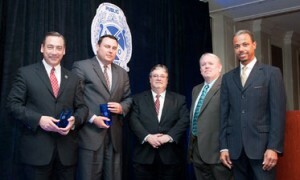 From left: NYPD Deputy Chief Chuck Dowd and San Jose PD Deputy Chief Christopher Moore received the Ledership in Advocacy Award, presented by Stu Overby from Motorola, APCO President Richard Mirgon and APCO Executive Director George S. Rice Jr. The first award presented was the Leadership in Advocacy Award. Deputy Chief Christopher Moore, San Jose (Calif.) Police Department, and Deputy Chief Chuck Dowd, New York City Police Department, both seasoned law enforcement officers, were honored for their work in advancing the campaign to create a national, interoperable public safety broadband network. The Leadership in Regulatory Service Award was presented to Brian Marenco, of the FCC Public Safety and Homeland Security Division. Marenco has negotiated agreements with Canada and Mexico to allow U.S. public safety systems to operate along the borders, resolving serious spectrum disputes. Rep. Peter King (R-N.Y.) received the Leadership in Legislative Service Award, honored for his leading efforts as chairman of the Homeland Security Committee on public safety funding and port and chemical plant security. In Congress, he has also led the effort to restore funding to the Secure the Cities Program. Governor Tim Pawlenty (R-Minn.) and Governor Martin O’Malley (D-Md.) received the Leadership in Advancing Communications Policy Award for their support in allocating resources to public safety and investing in interoperability initiatives and broadband communications through their policies. A Special Recognition Award was presented to Rear Admiral Michael Brown of the Department of Homeland Security, Office of Cybersecurity and Communications, honored for his leadership in securing funding for public safety communications.The Marilyn J. Praisner Award for Leadership in Local Government Communications Policy, which is awarded in conjunction with the National Association of Counties (NACo), was presented to Timothy Loewenstein, county supervisor for Buffalo County, Neb. Loewenstein was honored for his work on the Steering Committee of the National Coordination Committee, recommending standards for technology and deployment of the public safety interoperable bands in the 700 MHz spectrum to the FCC. This year, the Public Safety Foundation of America (PSFA) established the Public Safety Fellows Program to recognize individuals for their leadership in research activities and service to local government while acting as a resource to planners and managers on emerging technology issues. William Schrier was honored as the first fellow for his involvement in the campaign to get the D Block allocated to public safety. For more information about the dinner, visit leadersdinner.apcointl.org.